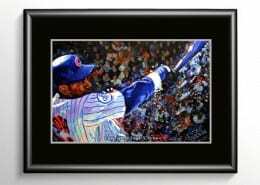 Sammy Sosa painting – after years as a respected power hitter, he emerged during the 1998 season as one of baseball’s greatest. 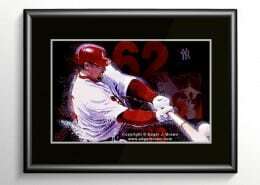 It was in this season that both Sosa and Mark McGwire passed Roger Maris’ long-standing single season home run mark of 61 homeruns. Sosa ended the season with 66. 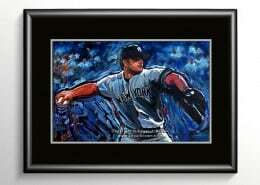 This painting was featured in the Latino American Baseball Greats exhibit at the Yogi Berra Museum.